Curtain Up Cookie Design: Welcome to Curtain Up Cookie Design! Hello Everyone! My name is Catherine. I am a stage manager in New York City. I love theater. I also love decorating cookies. I have been decorating cookies every Christmas since I can remember, and recently I’ve been expanding that tradition into a full-time hobby. 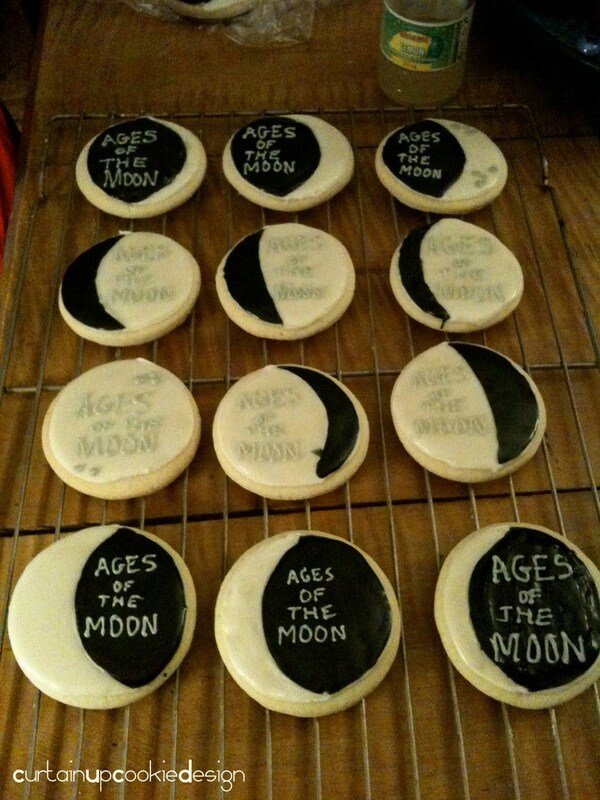 I am currently doing a Stage Management Fellowship at the Atlantic Theater Company, and it has become a tradition of mine to decorate show-related cookies for closing night (way too busy to get them done by opening). My first foray into this idea was for Two Unrelated Plays by David Mamet: School and Keep Your Pantheon last October. This was the show artwork (left) and these are the cookies I made (right). This was before I'd really gotten into the whole thing (I've learned A LOT of techniques and such since, and even took a class at the ICE), but creating these from scratch (I even made a cookie cutter out of wax paper to get the right shape!) really inspired me to see where I could take this. The second show of the Atlantic season, Ages of the Moon by Sam Shepard, didn’t have a logo to work off of so I had to think something up. I didn't have enough time to make them exactly how I wanted to, so they turned out more like black-and-white cookies, but I got more practice with writing. From this little custom I have dreamed up a Broadway bakery of sorts, and I wanted to create this blog as the first step! I'll be posting pictures of all of the cookies I create, as well as more theater-related things such as reviews of shows I've seen and info about what I'm doing at the moment, so stay tuned for more from Curtain Up Cookie Design! I had several they tasted and looked amazing!! !